On a recent lazy Sunday I was in the mood for some decent Tex-Mex food. Anyone who is close with an American such as myself will know that Tex-Mex (or American-Mexican) food is commonly cited as a comfort food for most of us Americanos. For me, back in the US it was always a go-to meal to close out another weekend with my college buddies as we could splurge on flavor and taste without shelling out too much of our cash. After scrolling through Wingspoon (a Korean foodies app similar to Yelp) my friend and I decided to have an early dinner at Julio's in Jongno which had gathered some good reviews (albeit, mostly by all Koreans). Entering the place, the layout of the place was simple enough though the real draw for me was the gorgeous views of Cheonggycheon from the restaurant's third floor. The place featured your standard menu of Tex-Mex dishes including burritos, tacos, enchiladas, cocktails and a few beers on tap. Most of the dishes were in the range of 8,500 to15,000 KW or so if I recall. I realized later that this Julio's was part of a chain including a branch in Gangnam I had visited around two years ago or so. My friend chose the beef burrito while I went with the enchilada, with beef as well. Other options for the main filling were included such as chicken and pork. I contemplated doing a Coronarita for kicks but decided 5 p.m. was a bit early. Our meals arrived in about 8 or so minutes. Swimming in a pool of enchilada sauce and refried beans was my enchilada with generous lines of sour cream, diced onions and cheese on top. The bits of cilantro (not a particular favorite but I always feel is needed in Tex-Mex food) were a nice touch. Cutting it open I discovered a good filling combination of rice, meat, cheese. They had on hand Ligo hot sauce for every table. It ain't no Tapatio or Cholula but it did the job. My friend's burrito pretty much had the same filling but with a lot of lettuce. Some sour cream came on the side for the burrito which was nice. Ultimately the food was nice, nothing too out of the ordinary which I guess is still a good sign for Tex-Mex food in Korea as any American will have his or her share of horror stories of the "tex-mex" dishes they've had here. After sampling both dishes though, I'm convinced the beef wasn't of the highest caliber in terms of quality as I found myself chewing through some gristle-like and stringy bits more than a few times. And I was just a bit surprised when I saw a microwave in the open kitchen as I recalled the menu even clearly stating Julio's never microwaved anything or something to that effect. I was even more surprised when one of the waitress began heating up what looked to be tortillas in the microwave for someone else's order. I mean, if they're going to fib about what they're promising, they might as well have at least put in the effort to try and hide it instead of being so blatant, no? Then again, the real authentic Tex-Mex food I'm talking about isn't any fine dining either. 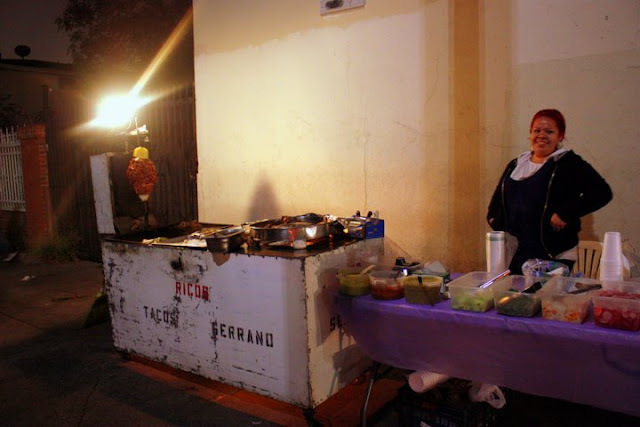 I still dream about my favorite dilapidated street cart taco stand in LA- Rico's. Sure to violate all sorts of health code laws, this is the sort of Am-Mex-ish food I really crave at times but.... we can't always have it all can we? Anyways, Julio's proved a decent place to go when you're experiencing the cravings and in the area but hardly anywhere I'd recommend someone to go out of the way to hit up. Within the Jongno area, Tomatillo's in the basement of the Centum Tower is probably going to be the only other decent Mex place nearby. But at similar prices I'd say it's better to score yourself a seat with a better view at Julio's then being in the basement of an office building like Tomatillo's Jongno branch. If you are looking for a quiet place to enjoy some Tex-Mex food on a weekend though, Tomatillo's may be a safer bet as Centum Tower's basement restaurants always seem deserted on weekends. My opinion remains the same after the multiple visits to the Julio's, the Tomatillo's and the Vatos- probably the best Tex-Mex food you can have in Korea (and also with the best value and portions) will almost certainly come from your own kitchen. That reminds me, it's definitely time for another Tex-Mex night at my house. If you're coming by subway, come out of Jonggak Station (종각역), exit number four and walk straight about 150 meters until you get to the big alley, flanked by a Missha and Alo glasses store. You should see multiple street stands lined down the middle of the alley. This alley is also known to many locals as 피아노거리 or piano street because the floors used to have piano key designs on them. If you have the Naver Coupon app, look up the Julio's in Jongno and download a coupon to get a free Americano or soda with your order. Only works on weekdays though and must be used on the day you download the coupon. Thank you so much for this blog post! I just moved from the 역삼 area to the 이문동 area. I had been craving Tex-Mex food for the past month and had no idea there was a Julio's so close by! I'm going to venture out and see if they'll be open on lunar new year. Happy 설날!